If you have set up your software, you usually want to know whether it works. This section discusses topics related to configuration, monitoring, troubleshooting, and debugging of xntp. Without any doubt, troubleshooting requires monitoring. Somehow you must find out that something is wrong before you wonder how to fix it. 8.1.1. If I think my NTP server is working fine, what could I do to confirm this? 8.1.3. How can I see the Time Difference between Client and Server? 8.1.4. What does 257 mean as value for reach? 8.1.5. What can I use these statistics files for? One of the quickest commands to verify that ntpd is still up and running as desired is ntpq -p. That command will show all peers used and configured together with their corner performance data. As the above command requires periodic invocation to monitor the performance, it is also recommended to enable statistic files in ntpd. See also Q: 8.1.2. and Q: 8.1.3..
Usually I only monitor the loops file. Table 3 lists the individual fields of each file. I'll show examples for peerstats and loopstats for version 3 and 4 in the following screens. ntpq -p will display the offsets for each reachable server in milliseconds (ntpdc -p uses seconds instead). ntpdc -c loopinfo will display the combined offset in seconds, as seen at the last poll. 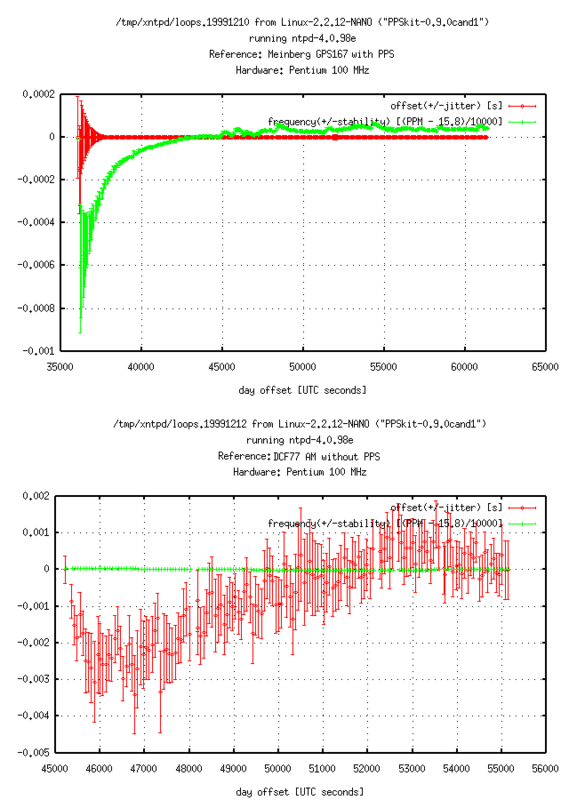 If supported, ntpdc -c kerninfo will display the current remaining correction, just as ntptime does. The first can be used to check what ntpd thinks the offset and jitter is currently, relative to the preferred/current server, the second can tell you something about the estimated offset/error all the way to the stratum 1 source. Q: 8.1.2. describes a way to collect such data automatically. If a PPS source is active (see Q: 5.2.4.1. and Section 6.2.4), the offset displayed with the second choice is updated periodically, maybe every second. Sometimes things are wrong and you may want to compare time offsets directly. An easy way is to use ntpdate -d server to compare the local system time with the time taken from server. (Inspired by Martin Burnicki) The value displayed in column reach is octal, and it represents the reachability register. One digit in the range of 0 to 7 represents three bits. The initial value of that register is 0, and after every poll that register is shifted left by one position. If the corresponding time source sent a valid response, the rightmost bit is set. Thus 257 in the dual system is 10101111, saying that two valid responses were not received during the last eight polls. However, the last four polls worked fine. Still another utility named plot_summary.pl can be used to make plots with these summary data. As an alternative you could plot the loopfilter file directly with gnuplot using the command plot "/var/log/ntp/loops" using 2:3 with linespoints. Figure 6 had been produced with a little more complicated command. It shows yerrorbars with the estimated errors for offset and frequency respectively. The reference clock, the antenna, and the computer system were located in an office room without air condition. Now that we are looking at numbers and graphs, let us compare the data of a GPS clock (using PPS) with a typical low-cost clock (not using PPS). Figure 7 shows a very small offset for the GPS clock. The frequency is continuously adjusted. 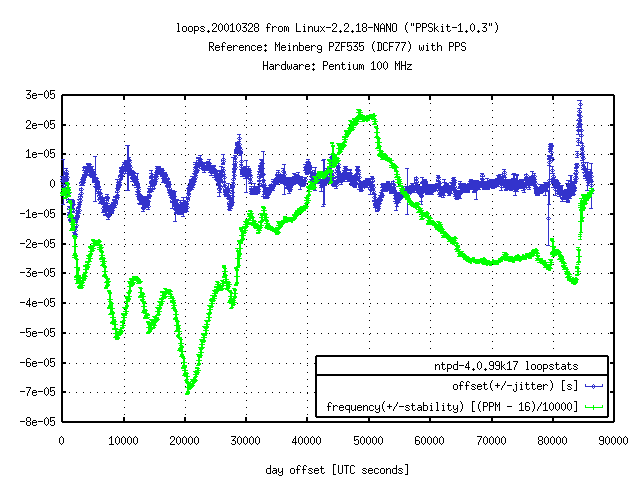 In comparison, the DCF77 clock shows a high variation for the offset, but the frequency is adjusted less drastically (Figure 6 shows values between those, using a better DCF77 receiver with PPS).